This potato salad is yummy with lots of great flavors like oregano, olives and dills. 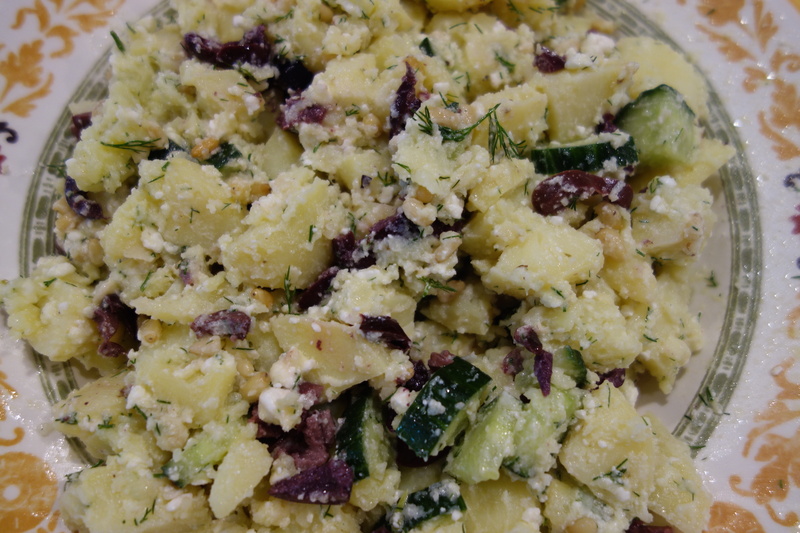 I prefer my potato salad with a lemon dressing and this one has amazing crunch with cucumbers and pine nuts. 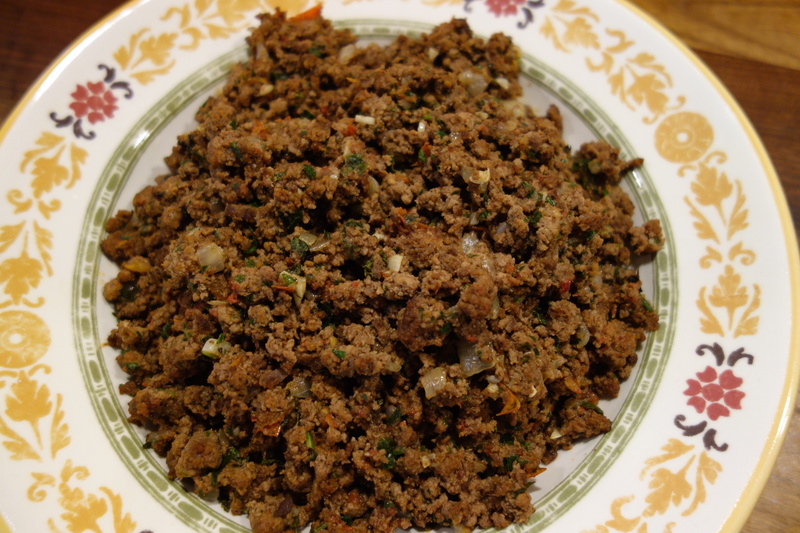 It is a great side with burgers or any meat or fish! Place the potatoes in a large saucepan, cover with water and bring to a boil. Lower the heat to a simmer and cook till the potatoes are soft but not mushy, about 6 to 8 minutes. Drain and transfer to a serving bowl. While the potatoes are still warm, pour the dressing and mix well and keep aside. Add all the ingredients to the warm, dressed potatoes. Mix well and check for seasonings. Let the potatoes sit for at least an hour before serving. This is a yummy dish for meatless Monday. 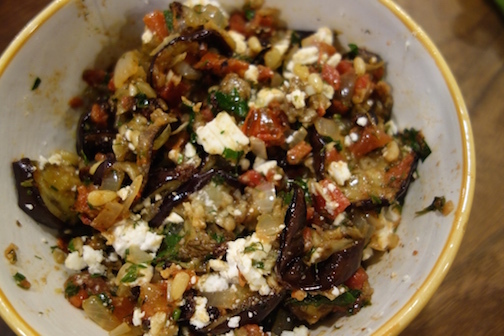 It has delicious roasted eggplant flavored with mint, cinnamon, tomatoes and feta. 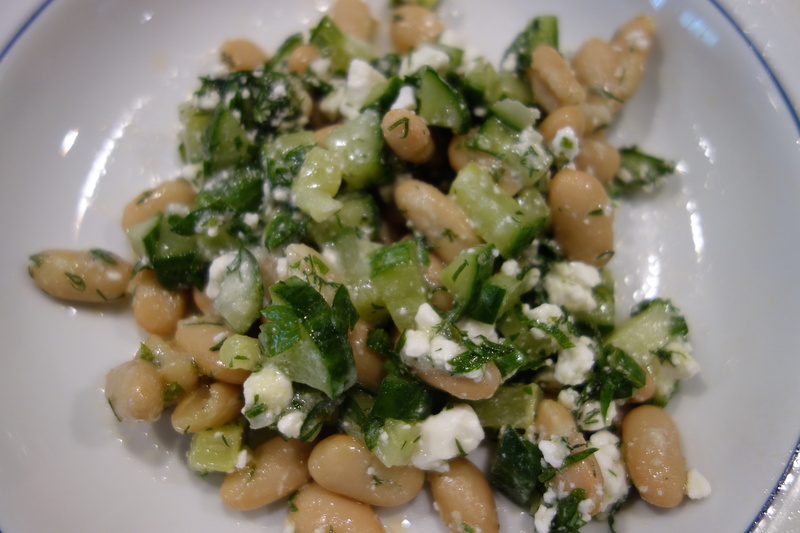 It is a great side dish or a dip with warm pita bread! Place the sliced eggplant on a cookie sheet, drizzle with oil and sprinkle some salt. Broil under medium heat turning the slices once till both sides are golden brown- about 10 minutes. Take out of oven and keep aside. Add the olive oil to a heavy saucepan and add the mint and cinnamon. Cook for 15 seconds on medium high heat and add the onion, garlic and pine nuts. Saute on medium heat for 5 minutes. Add the tomatoes and currants. Saute for another 5 to 6 minutes. Add the eggplant and salt to taste. Mix well and cook for 5 minutes. Turn the heat off and add the parsley and dill. 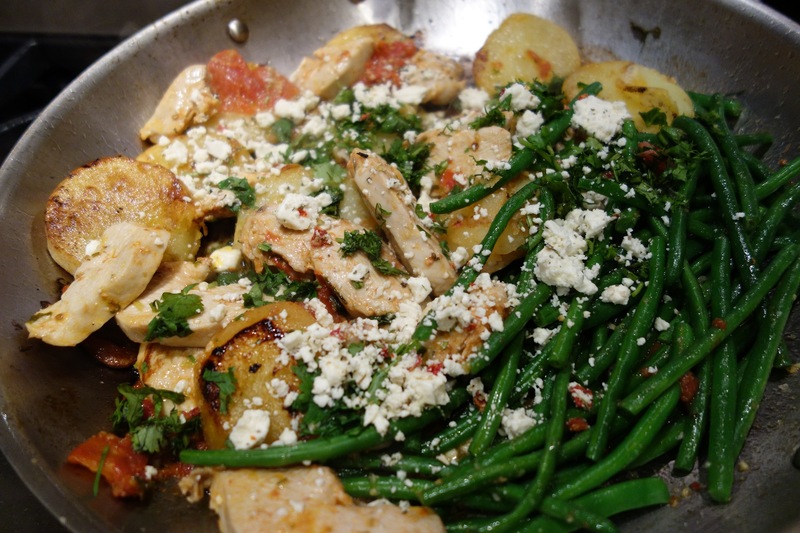 Once the dish is completely cooled off, add the feta and mix well. Serve room temperature. I made this delicious salad for my book club meeting the other day and it was a big hit. This salad is perfect for a meal or as a side with any meat or fish… either way, it is yummy!! I love the Greek flavors including the feta and dill!! Add all the ingredients to a serving bowl, mix well and let the salad sit for at least an hour before serving. 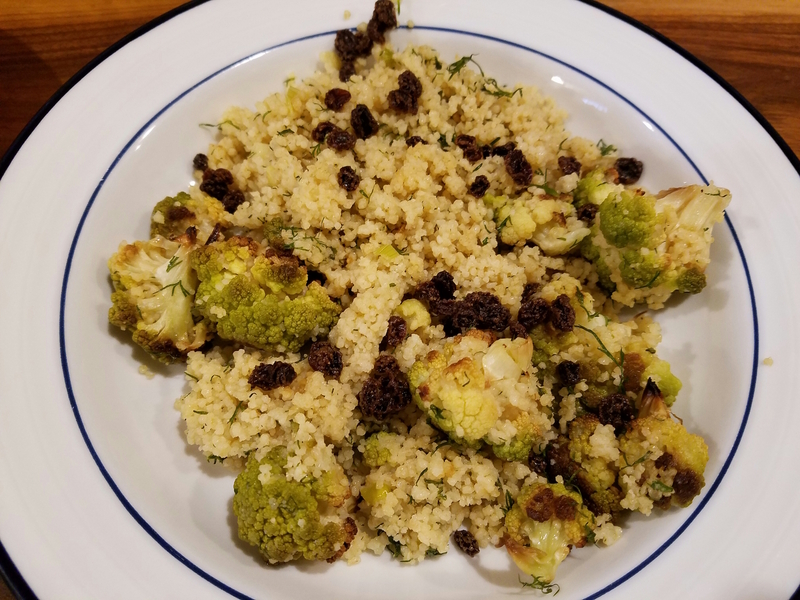 I thought I would post recipes this week that have lots of summer ingredients.. since you can still find all the fresh ingredients.. although this one can be made any time of year, but it is particularly delicious with some grilled fish or meat! 1 cup barley (I used the quick cooking variety), cooked according to package directions. Instead of water, I used chicken broth, juice of half a lemon and 1 teaspoon salt to cook mine. Cool the barley and add to a serving bowl and let cool. 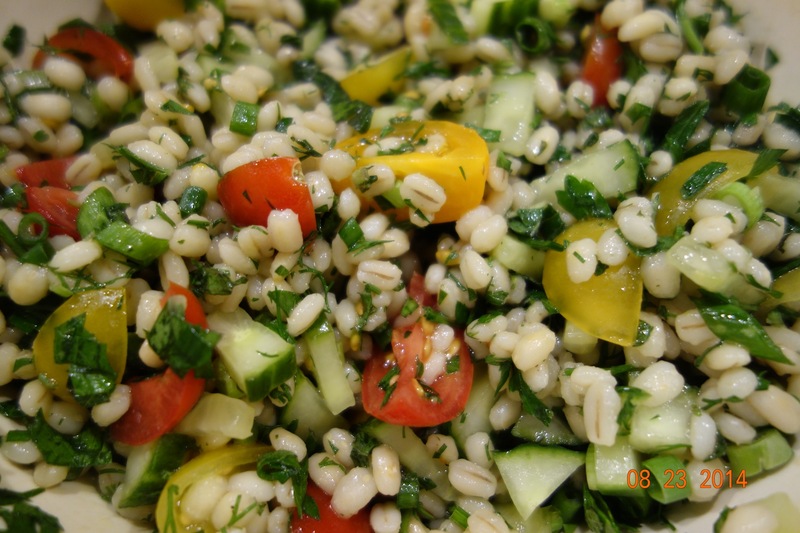 Add the parsley, mint, dill, cucumber, tomatoes, lemon juice, oil and salt to the cooked barley and mix well. Let the salad sit at room temperature for at least an hour before serving. This is a delicious, quick, healthy meal to make through the week. Best of all, I made it a one pot meal.. I used my largest frying pan (14 inches), it was large enough to fit everything. In case you don’t have crazy large pans, just cook the ingredients in batches and put them together at the end. Marinate the chicken pieces with the tomato compote/sauce, garlic, oil and salt. Mix well let sit for 2 to 3 hours in the fridge. Place the potatoes discs in a medium pot and cover with water. Bring to a boil and let simmer for about 5 to 10 minutes or till the potatoes are tender but not mushy. Add the beans while the potatoes simmer and blanch for 1 minute. Take the beans out with tongs while the potatoes are still cooking. Place the beans in cold water to stop the cooking. Drain and keep aside. Once the potatoes are cooked, drain and keep aside. Heat a large frying pan with 2 tablespoons olive oil. Add the chicken pieces and brown both sides, either together or in batches depending on the size of the pan. Take the chicken out and add more oil if necessary and add the potatoes. Brown both sides on medium heat. Move the potatoes aside and add the beans and toss them for 2 to 3 minutes. Add salt. Add the chicken back and finish cooking through. Top with feta, parsley and dill. Check for seasonings and add salt. Serve warm.